Well organised and appointed, the meeting hall of opulent Grand was distinctly impressive. It has everything one would expect, from the intricate carvings, wall mounted typography to the quintessential lanterns and authentically styled designs. Walking up the tall staircase towards the hall, we were greeted by young, stylishly dressed patrons who registered our blogging entities with a warm welcome. 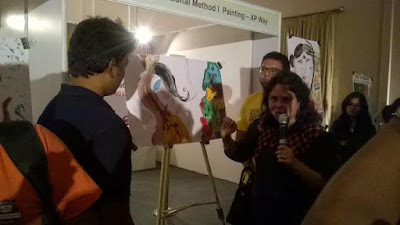 The soundtrack of soulful and funky music made spontaneous participation a very real proposition...the tweets, the cultural snapshots, the reality of quotidian life of Bengal was portrayed in the large canvas and winners were declared. Lots of options and DIY activities made one feel at home with the surrounding and all the bloggers with a plethora of phenomenal talents were given the citadel to express their creativity. My personal experience was awesome as I gained a deeper insight into blogging and developed a unique interpersonal relationship with the other bloggers. Indeed, Berger paints and IndiBlogger collaboration is obviously a promising indication of our nation’s progress. The most enjoyable activity was the sand removal and art theme. We were made to participate in groups and for the first time wearing masks and gloves with sandstone paper in hand the groups removed sands from the blocks with herculean effort. The painting concept too was enlightening as it evoked a lot of ideas and visions thus enlarging our vista of life. Well, the food and beverages served with starters was a delightful diversion and the sumptuous dinner was overwhelming to me at least. Well catered and courteously served it was a sizzling affair and at the end of the day we were in the midst of a friendly ambience exchanging cards, mobile numbers and taking snapshots with the stupendous decor of the grand as our backdrop. I am indebted to IndiBlogger and Berger Paints to have created this opportunity to exchange the vignettes of our life and also profoundly impressed by Berger Express Painting Technology that offers eco friendly painting which is hassle free and time reducing. The instruments were definitely high- end technological device which will enhance painting in a new way and will be a shift in the paradigm. Moreover, the whole concept has set in a new standard and has given us a new route to realign our lifestyle. The free flow of imagination, the rejuvenation of the senses and the splash of colours adds vividness to our nature and we are swayed by the comprehensive themes displayed in front of us which is like a harbinger of spring to make us take unprecedented stride towards aesthetics. The effort to unleash the hidden talents in the depths of our minds and to channelize our oeuvre is indeed a tremendous achievement. Such effort not only focuses on individual talent but also lifts one from the abyss of depression and negativity. The cause is phenomenal and we have been highly motivated. And in future I would definitely look forward to such eventful meetings which are “a bliss of solitude”. Very nice description of the event! Makes me feel as though I had personally attended it!